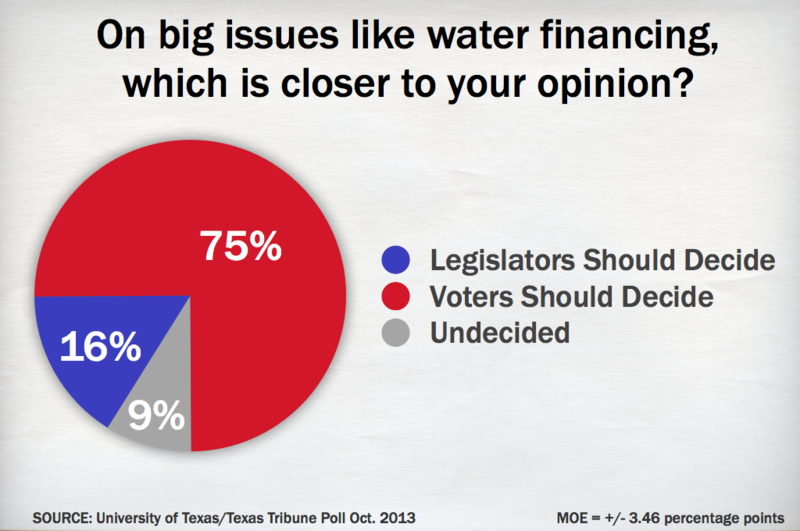 Half of Texans say they’d vote to approve $2 billion in additional water infrastructure financing this November, according to a new University of Texas/Texas Tribune poll. 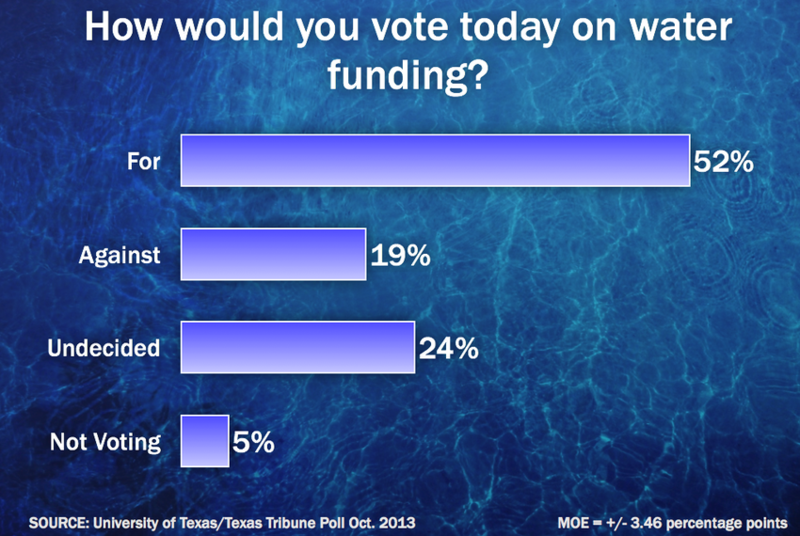 Texans support $2 billion in water infrastructure financing by a better than 2-to-1 margin, but nearly a quarter haven't decided how they will vote on the issue this November, according to a new University of Texas/Texas Tribune Poll. The respondents favored the measure, known as Proposition 6, 52 percent to 19 percent. A quarter said they had not decided how they would vote. Political leaders including Gov. Rick Perry have been urging voters across the state to pass the proposition, saying the state’s future depends on it. They have some work to do: Asked how much they have heard about the constitutional amendments on the November ballot, nearly one-half of the respondents said they had heard either “not very much” or “nothing at all.” Only 9 percent said they had heard “a lot” about the amendments. 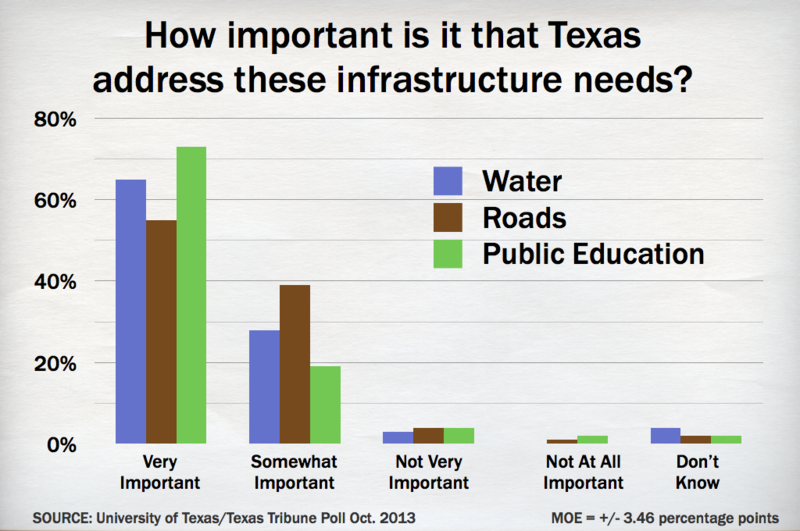 The poll found Texans put a high priority on public education, water, and roads and highways. Asked to rank those things, 73 percent said they consider addressing public education needs to be very important, 65 percent said the same about water, and 55 percent gave that highest importance to roads and highways. Proposition 6 would move $2 billion from the state’s Rainy Day Fund to a newly created State Water Implementation Fund for Texas, or SWIFT. The Texas Water Development Board, which makes loans for water projects, could use that money as a revolving fund to lower borrowing costs for its debtors. The creation of SWIFT, reorganization of the Water Development Board and adding Proposition 6 to the ballot were the major steps taken by the Legislature this year to address historic drought conditions in Texas and the threat of further water shortages as the state’s population continues to explode. But if voters don’t come through in November, environmentalists and state officials warn, that all could come to nothing. “In order for some of that good policy to be meaningful, we’ve got to see Prop 6 pass,” said Laura Huffman, head of the Nature Conservancy’s Texas office, noting that 20 percent of the $2 billion would go toward water conservation projects. Many conservative groups strongly oppose the measure, saying it will only encourage local governments to continue to borrow and fall deeper into debt. A number of groups including Independent Texans, the Texas Drought Project, Save Our Springs Alliance and the Tea Party group We Texans have planned events encouraging voters to reject the amendment. They have questioned what happened to more than $6 billion in bond money that voters approved for the water projects over the last 15 years that has still not been used. But that money is distinct from the funds in Proposition 6. The bond funds can only be used for loans — not to make them more attractive by lowering interest rates or allowing deferred payments. The SWIFT money would address the latter. Water Development Board spokeswoman Merry Klonower said it’s likely the bond money will flow more quickly if the loans themselves can be made more attractive. “Water suppliers have told us these are the kind of financial incentives they need to jump-start their water supply projects,” Klonower said. She added that in the past, when the Legislature allotted money to make loans cheaper, there was far more demand for Water Development Board funds. Proposition 6 could reduce interest rates by up to 50 percent, she said. Debra Medina, leader of the group We Texans and a candidate for state comptroller, said Proposition 6 was tantamount to predatory lending for local governments already buried in debt. Respondents who said they would support a Tea Party candidate for Congress were more likely to oppose Proposition 6 than those who prefer Republican and Democratic candidates. Only 16 percent of Democrats and 21 percent of Republicans were against the measure, but 28 percent of Tea Party voters oppose it, according to the poll. Opposition was similar among respondents who identified themselves as independents, but Henson said respondents who identified themselves as independent were also less likely to be informed about the issue and less likely to vote overall. Of the respondents who said they vote in every election or in nearly every election, close to 60 percent said they would approve Proposition 6. “There’s not a groundswell of either conservative or liberal opposition to this,” Henson said. That could allay concerns from the measure’s supporters that a low turnout, coupled with energetic opposition, could sway the election in opponents’ favor. Fewer than 4 percent of Texans turned out for similar votes on constitutional amendments in 2011. Meanwhile, Texas legislators are gearing up their campaigns to travel across the state and encourage voters to approve the amendment. According to the latest campaign finance data, the Water Texas PAC, led by House Speaker Joe Straus, R-San Antonio, and Rep. Allan Ritter, R-Nederland, raised nearly $1 million and still has close to $500,000 in cash on hand. State Sens. Troy Fraser, R-Horseshoe Bay, and Tommy Williams, R-The Woodlands, have helped raised about $32,000 for the H204Texas PAC, which has about $10,000 cash on hand. The bulk of Water Texas’ donations came from large corporations like the Dow Chemical Company and Valero Corp. H204Texas’ largest donors are Freeze and Nichols, a prominent Austin water engineering and consulting firm, and the Phillips 66 company, an energy and logistics company based in Houston. Critics have seized on those numbers as evidence of big business’ oversized interest in Proposition 6. This University of Texas/Texas Tribune internet survey of 800 voters was conducted Sept. 27-Oct.4, 2013, and has a margin of error of +/- 3.46 percentage points. Numbers in the charts might not add up to 100 percent because of rounding. Support for the poll came from the Meadows Center for Water and the Environment at Texas State University and In the Flow, the center's water policy newsletter co-published with the Tribune.